St. Paul refers to John, along with Peter and James, as "these leaders, these pillars" of the Church in Jerusalem (Gal. 2:9). According to tradition, John went to Rome during one of the early persecutions under Emperor Domitian and miraculously escaped martyrdom by emerging from a cauldron of boiling oil unscathed. He was exiled to the island of Patmos where he began his writing with the Book of Revelation. Later, after the death of Domitian, John returned to Ephesus where he wrote the fourth gospel and three epistles. He died there in about 100, the last surviving apostle and the only apostle who did not suffer martyrdom. 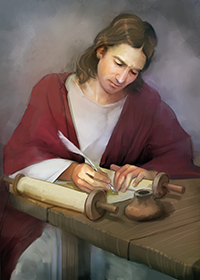 The writings of John are unique among the Evangelists. In many of the events recorded by him, he writes as a playwright would; first setting the stage, then describing the characters, and, finally, presenting the dialog which took place. Three examples of this quality found in his gospel are Jn 4:5-42 (the woman at the well); Jn 9:1-41 (the man born blind), and Jn 11:1-45 (Lazarus raised from the dead). St. John the Evangelist is often called St. John the Divine in England and in the Eastern Church. A Feast honors this saint on December 27.